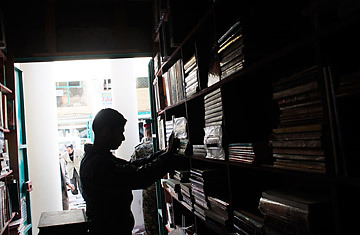 A bookseller shelves books at a shop in the Mutanabi street book market February 4, 2009 in Baghdad. Mutannabi Street, in central Baghdad, has had many names. In the second Abbasid period, it was the Paper Market. Under the Ottomans it was Military Bakery Street. Under the British it was Hassan Pasha Street. The current name dates from 1932, when the Ministry of the Interior renamed much of the city. In all its guises, the street has been famous for booksellers  and much beloved. Informally, it is often called the "artery of Baghdad." On March 5, 2007, it was largely destroyed by a car bomb. "Here, they also sold bridles, saddles and shoes for religious men," says Afram Hussein al-Fufuli, 69, concluding my history lesson. My translator-colleague and I had been directed to Fufuli by a younger bookseller up the street, who called him "the dictionary." In his brown blazer and sweater, Fufuli did indeed have a professorial air. Framed by dusty stacks of books tall as himself (between Arabic volumes: John Le Carré, Macroeconomic Theory, Richard Nixon's Leaders), he conducted slow business out of a small brick storefront, which, he said, his father opened in 1930. Fufuli described how, when the car bomb exploded nearby, all his books were knocked down and his metal gate was twisted. "Thanks to God, I was away from the shop at the time," he says. After that, for a while, the street was deserted. The explosion killed 38 and was a well-documented tragedy. What has been less widely reported is that Mutannabi Street doesn't have so many bookstores anymore. Though low tables of (mostly technical) volumes line the sidewalks, they seem to be equaled or outnumbered by stationery, electronics and knickknack shops. One storefront is stocked entirely with stuffed toys. According to Fufuli, the ratio is now 10% books, 90% other stuff. He is exaggerating, but the change is clear. "Most of the old owners were killed or left because they were afraid, so these stores opened up. Now," he added, with a curmudgeonly frown, "all the Iraqi people want is valentines, stuff for kids." Picking a nearby store at random, one that sells electronics, I ask the owner, Ayman, 30, about the changing nature of the street. His shop had been a bookshop, he says, but "the old owner was killed and the shop destroyed by the blast"  he raises his eyebrows  "as if the building was a target." At his desk, between printer cartridges, laminate film and boxes of thumbtacks, Ayman did not think an electronics store on a street of ancient booksellers was strange. "The people who read things need to print," he explains, "so I opened a shop to complete the picture." Ayman does not read himself, he tells me, except manuals for copy machines. Fixing them is his hobby, though he bemoans the current models. "Now all the copy machines are very commercial. You used to be able to fix the old ones yourself." A strange hobby, granted, and perhaps out of place on a street with so much literary, if bookish, romance attached to it. Mutannabi Street is named for Abu Tayeb al-Mutannabi (1915-65), a famously fierce and brilliant poet from Kufa, south of Baghdad. "The most noble place in the world is the saddle of a fast horse," he wrote in one poem, "and the best companion ever is a book." It may be that copiers are of greater value than horses in Baghdad these days, but one wonders what Mutannabi would have made of the street that bears his name. Fufuli, for one, shrugs at the street's evolution. "I did not leave [after the bomb blast] because I loved my father's business," he says. "But no one will take over my store. My son studies computer science. It will be sold." In the meantime, he is simply pleased that security has improved, though as he puts it, looking down the street, "it has not reached safety." He shakes his head. "The measurement is when there are a lot of women here." And that was when I realized another strange thing about Mutannabi Street  over the course of an hour, among the many pedestrians strolling along Baghdad's artery, I had seen only one pair of women.